OSWEGO — A noted expert and author on edible ecosystems will help inform the design and spring-planting initiatives for SUNY Oswego’s permaculture living laboratory, a sustainable micro-farm and landscape taking shape between Shineman Center and Lee Hall. Work parties last fall and this spring have layered mulch and cardboard at the site of the permaculture living laboratory between Shineman Center and Lee Hall, preparing raised garden beds for plantings to follow a May 1 to 3 series of presentations by edible-ecosystems expert Dave Jacke. Here, Oswego Crew Club members work April 12 at the site: From left rear to right foreground are Garret Edick, freshman adolescence education major; Sarah Balseiro, junior dual major in human resources management and economics; Jen Labas, junior dual major in communication and social interaction and in global and international studies; sophomore accounting major Aaron Cassidy; Kailey Brigande, junior childhood education major; and junior public justice major Angela Valentin. Dave Jacke, a consultant and primary author of “Edible Forest Gardens: The Ecology and Design of Home Scale Food Forests,” will speak May 1, lead an all-day workshop May 2 and conduct an open consultation about the design of the three-fourths-acre permaculture site on May 3. The permaculture project surfaced a year ago when then-mental health counseling graduate student Grace Maxon, now of the college’s Office of Learning Services, and mathematics faculty member Kate Spector unveiled a 48-page proposal that keyed on ways permaculture could help meet institutional goals for sustainability, rich experiential learning, opportunities for undergraduate research, community outreach and engagement for students of all ages. Maxon and Spector have worked with members of the greater Oswego community as well as leaders, faculty, staff and students across campus to make the proposal a reality. They are excited to get under way soon with planting, following Jacke’s appearances: a free presentation at 7 p.m. May 1, “Ecology, Design and Agriculture: A New Synthesis”; a May 2 workshop from 9 a.m. to 5 p.m. titled “Gardening Like the Forest: Fundamentals of Ecosystem Agriculture”; and the open consultation from 9 a.m. to 5 p.m. May 3. All events are in Room 122 of the Shineman Center, but require registration at www.oswego.edu/permaculture. While free for SUNY Oswego students, faculty, staff and alumni, the event carries a $50 fee for the final two days for off-campus participants. The product of a series of campus and community stakeholder meetings, the current design has benefited from a profusion of ideas, Maxon and Spector said. For example, students wanted to see a fire pit to encourage the garden as a meeting place, and it has made its way into the plan. Technology students are working to build compost bins, which will reuse food waste from Lakeside Dining Hall. Computer science students under faculty member James Early plan to install small air quality sensors they are building as part of a class. Interns from the zoology and health promotion and wellness programs assisted the project last summer, and Mike Lotito, engineering coordinator with the college’s Sustainability Office, has been among those working closely with the permaculture committee on the plans. The committee includes Valerie DawnStar of Oswego, long interested in alternative systems of creation. Fifteen flats of seedlings are head-starting crops of annual vegetables inside Shineman Center’s greenhouse, and Maxon and Spector anticipate edible perennials — hops, mushrooms and trees bearing apples, cherries, pears and exotics such as smooth, creamy pawpaws. Crews of volunteers prepare to get them all in the ground. Though the design is a work in progress, the permaculture garden’s team has led several work parties last fall and this spring to layer the site’s soil with sheet mulch, creating non-tilled, raised garden beds in several plots between driveways and sidewalks leading to Shineman and Lee. The installation, at this point, would involve annual and perennial plantings, an herb spiral, composting, vertical garden and a water catchment system housed in a small building that may double as a farm-to-market stand. 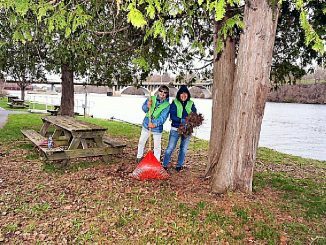 On a recent Sunday, 11 members of the Oswego Crew Club turned out to help mulch. The project also has captured the imagination of Dario Caminha Paiva, who is at Oswego through May with the Brazil Scientific Mobility Program. 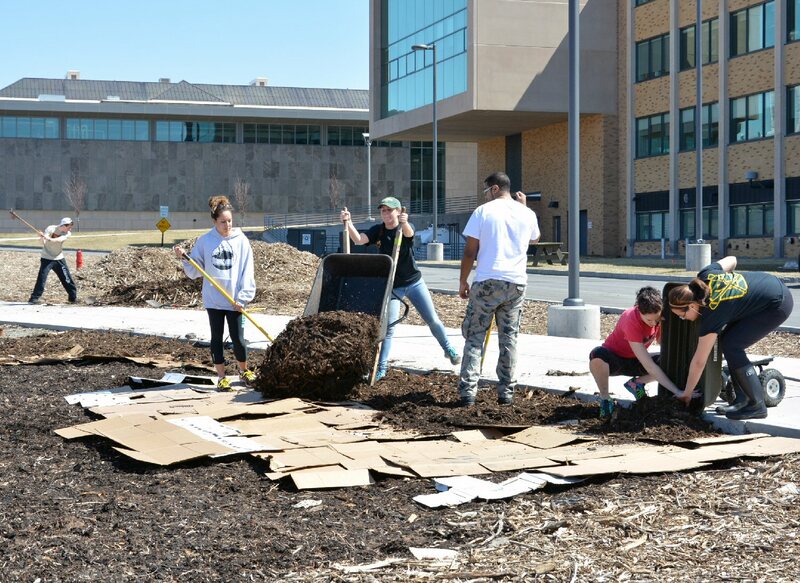 The permaculture living laboratory already has attracted the attention of the SUNY system’s sustainability site and the SUNY Student Assembly’s publication.